World-famous opera singer Alice Alquist has just been murdered at her home, No.9 Thornton Square. The perpetrator left without the jewels he sought after being interrupted by Paula, Alice's fourteen-year-old niece. Paula was raised by her aunt following her mother's death. After Alice is murdered, Paula is sent to Italy to train to become an opera star herself. Years later, an adult Paula (Ingrid Bergman) meets and marries Gregory Anton (Charles Boyer) after a two-week-long whirlwind romance. Paula returns to London on his insistence, where she knows no one, to live in the long-vacant London townhouse of her deceased aunt Alice. To help calm her anxieties, Gregory suggests they store all of Alice's furnishings in the attic. Before they do, Paula discovers a letter in an old book addressed to her aunt by a man named Sergius Bauer. Gregory's reaction is violent. However, he dismisses his outburst as one of frustration at the bad memories his bride is experiencing. After Alice's belongings are locked away in the attic, events take a turn for the bizarre. At the Tower of London, Paula loses an heirloom brooch that Gregory had given her, despite its having been stored safely in her handbag. A picture disappears from the walls of the house; and Gregory says that Paula took it, one of many instances of her removing and hiding it. But Paula has no recollection of having done so. Paula also hears footsteps coming from the sealed attic, and sees the gaslights dim and brighten for no apparent reason. Gregory suggests these are in her imagination. With Gregory looking on, Paula has discovered the letter from Sergius Bauer. Gregory isolates his wife from the outside world, implying that he is doing so for her own good, because her nerves have been acting up, causing her to become a kleptomaniac. He is also jealous and accusatory whenever others express an interest in her. When Gregory does take her out to a friend's house, he shows Paula his watch chain, from which his watch has mysteriously disappeared. When Gregory conveniently finds it in her handbag, Paula becomes hysterical, and he takes her home. Paula begins to believe she should not go out in public. A young maid, Nancy (Angela Lansbury), worsens the situation, as Paula becomes convinced that Nancy loathes her. Gregory secretly flirts with the maid and tells Paula she is paranoid and is imagining the maid's disdain. Paula does not know that her husband is in fact Sergius Bauer, her aunt's murderer. He sought out Paula in Italy with the aim of getting back into the house for Alice's jewels. He has been secretly rummaging through Alice's belongings in the attic to find the jewels he is certain are there. The footsteps Paula hears in the attic are actually his. The flickering gaslights he claims she has imagined are caused by his turning the attic lights on, thus reducing the gas to the downstairs lights. The kleptomania exhibited by Paula is all sleight-of-hand by Gregory. Gregory does everything in his power to convince his wife that she is going mad, hoping to have her institutionalized, giving him power of attorney over her, and allowing him to search unabated for the jewels. The plan almost works. Paula is saved by her trip to the Tower of London, as it also leads to a chance encounter with Inspector Brian Cameron of Scotland Yard (Joseph Cotten), an admirer of Alice Alquist since childhood. Seeing Paula rekindles Cameron's interest in the cold case murder of Alice and her royal jewels that were never found. With the aid of the police, Cameron figures out that Gregory slips into a vacant house next door and enters his own attic via a skylight. Cameron eventually gets inside the house to see Paula and confirms that the gaslights are indeed flickering, and she discovers the letter from Bauer that Gregory had told her was a figment of her imagination. That same evening, Gregory at last discovers the jewels hidden in plain sight, disguised as costume jewelry. He returns to the house to discover that Paula has apparently been visited by another man. Though he knows he has been discovered, he convinces the still confused Paula everything is in her imagination. However, Cameron appears in the doorway behind and arrests him with the help of police. Paula, finally convinced of her own sanity, indulges herself in a bit of revenge. She taunts Gregory, who is now bound to a chair but still trying to manipulate her, suggesting that she might cut him free so he can escape justice. She muses that the knife in her hand may not be real, before calling in Cameron to take him away. Encouraged by the success of the play and the British 1940 film, MGM bought the remake rights, but with a clause insisting that all existing prints of the first film be destroyed, even to the point of trying to destroy the negative. Evidently that order was not honored to the letter, since the 1940 Gaslight is still safely available for both theatrical and TV exhibition, as well as DVD release. 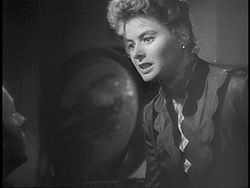 The psychological term gaslighting, which describes the form of psychological abuse in which the victim is gradually manipulated into doubting his or her own sanity, originated from the play and its two film adaptations. The fictional work is also considered the first artistic portrayal of this type of psychological abuse. Using the phrase in this way makes no sense, since the "gas light" in the movie is what proves that Bergman's character was not insane. According to MGM records the film earned $2,263,000 in the US and Canada and $2,350,000 elsewhere resulting in a profit of $941,000. When Gaslight was first released, The New York Times film critic Bosley Crowther praised the actors. He wrote, "And with Mr. Boyer doing the driving in his best dead-pan hypnotic style, while the flames flicker strangely in the gas-jets and the mood music bongs with heavy threats, it is no wonder that Miss Bergman goes to pieces in a most distressing way. Both of these popular performers play their roles right to the hilt. Nice little personality vignettes are interestingly contributed, too, by Joseph Cotten as a stubborn detective, Dame May Whitty and Angela Lansbury as a maid." A thriller soaked in paranoia, Gaslight is a period films [sic] noir that, like Hitchcock's The Lodger and Hangover Square, is set in the Edwardian age. It's interesting to speculate about the prominence of a film cycle in the 1940s that can be described as 'Don't Trust Your Husband'. It began with three Hitchcock films: Rebecca (1940), Suspicion (1941), and Shadow of a Doubt (1943), and continued with Gaslight and Jane Eyre (both in 1944), Dragonwyck (1945), Notorious and The Spiral Staircase (both 1946), The Two Mrs. Carrolls (1947), and Sorry, Wrong Number and Sleep, My Love (both 1948). All of these films use the noir visual vocabulary and share the same premise and narrative structure: The life of a rich, sheltered woman is threatened by an older, deranged man, often her husband. In all of them, the house, usually a symbol of sheltered security in Hollywood movies, becomes a trap of terror. ^ "BFI Screenonline: Dickinson, Thorold (1903–1984) Biography". Screenonline.org.uk. Retrieved 2014-02-22. ^ Horne, Philip (2008-10-04). "Thorold Dickinson's 1949 film The Queen of Spades has been called 'a masterpiece' by Martin Scorsese – so why is his work not better known?". London: The Guardian. Retrieved 2009-05-30. ^ Rush, Florence (February 1992). The best-kept secret: sexual abuse of children. Human Services Institute. p. 81. ISBN 978-0-8306-3907-6. Retrieved 16 June 2011. ^ a b Levy, Emanuel (2006). "Gaslight: Cukor's Masterpiece Starring Ingrid Bergman in Oscar-Winning Performance". EmanuelLevy.com. ^ Crowther, Bosley. The New York Times, film review, May 5, 1944. Accessed: July 24, 2013. ^ "Gaslight". NY Times. Retrieved 2008-12-18. Wikimedia Commons has media related to Gaslight (1944 film).